Within the last few months, we’ve begun to see the unveil of Google‘s major plans, making it difficult not to be wooed by the notion that Google is tampering with bigger things. It’s a company that loves to openly play with ideas; personifying themselves into our beloved science wizards. Now fathered by Alphabet and new Google CEO Sundar Pichai, the company is ready to bring the projects rumored about to light. Today’s featured project is Self-Driving Cars. Information on Google’s automated vehicles has been trickling slow but steady over the past year with other automotive and car sharing companies joining the race; such as Uber, Tesla etc. Today, Google announced the CEO of the self-driving project and it sent a quick shiver down my spine. Not out of fear, but chilling excitement. The kind of excitement you get when watching a sci-fi flick and realizing the next series of events are going to be climactic. That’s what the announcement of John Krafcik taking over as CEO did. It reminded us that the self driving movement is official, and it’s being put into full gear. 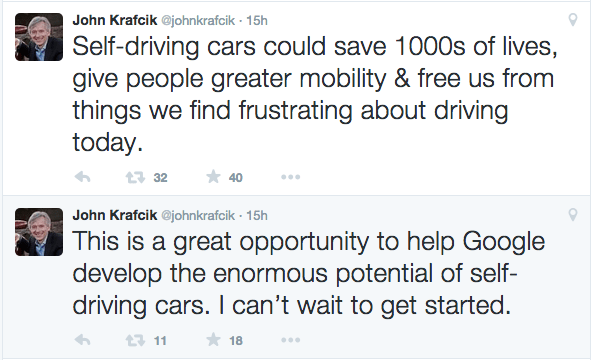 John Krafcik is an engineer with a BS from Stanford and a Masters from MIT. He’s worked for car companies, Ford, GM, Toyota, Hyundai and TrueCar. So it’s safe to say, he has the car down to a tee. But at Google, Krafcik is going to be working with a machine alien to him. Google’s self driving machine is a new breed of vehicle and perhaps that’s what’s enticing. What’s imperative — according to Courtney Hohne, Director of Communications at Google X — is that Krafcik’s background doesn’t imply that Google intends to be a large car manufacturer. “We’re not going to make cars ourselves,” Hohne told Automotive News, “We know what we’re good at, and we’ll partner with many different companies to bring this technology into the world safely.” Hohne implies that Krafcik’s job might be more of a conjunction, bringing Google’s technology and Car manufacturers to the same place in time. The ah-ha moment that’ll shift the conversation of automated vehicles from “some day” to “norm”.